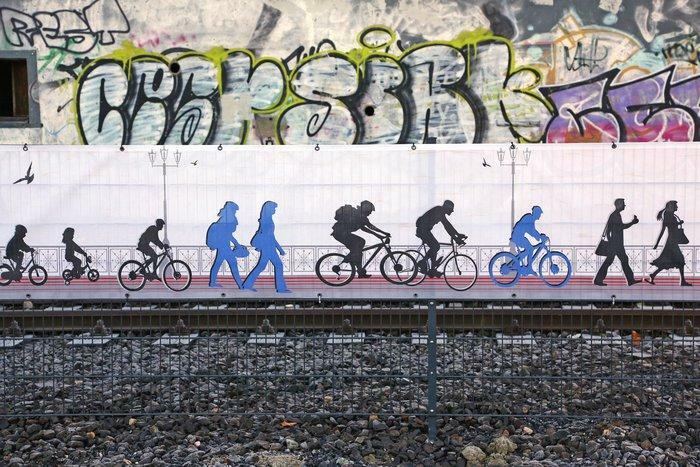 Last month, Germany opened its first stretch of “bike autobahn,” a cycle route that will eventually cover 100 km on the Northwest of the country. The design will pass through the Ruhr, the most densely populated region of Germany, where a network of industrial cities lies scattered at only short distances from each other. When complete, the route will bring a string of cities into 30 minutes cycle distance of each other, and where almost 2 million people will live within a 2km radius of the completed highway. Promoters expect this asset to become a viable commuter link, taking 50,000 cars off the road daily. The completed tracks are 4m wide, fully segregated from cars (route to run partly on disused railway tracks) and use bridges and overpasses to create a safer, smoother ride. At the moment, Munich and Cologne (link in German) are developing routes from the inner city into the suburbs and wider regions, which could link to this type of cycling infrastructure.